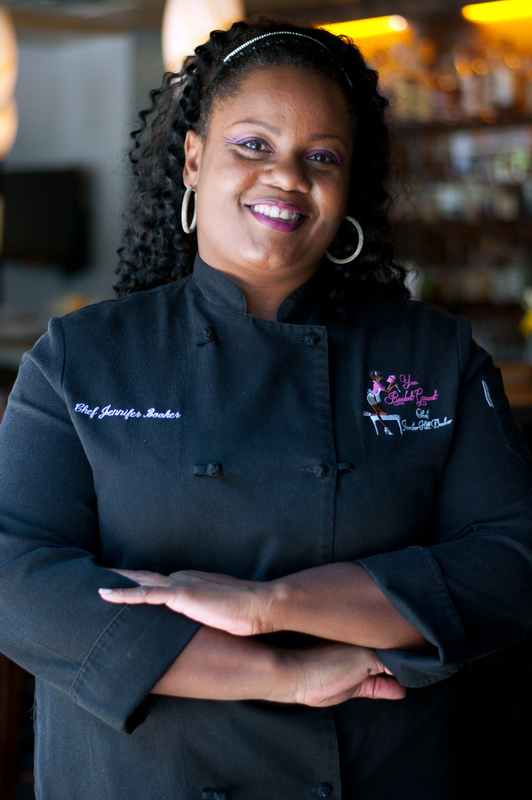 Chef Jennifer Hill Booker’s culinary path has not always been a linear one. She earned her Bachelor’s Degree from the University of Tulsa before graduating first in her class, eighteen months later, with an Associate of Occupational Science from Oklahoma State Institute of Technology. Extensive travel while married to an United States Army Officer pushed Jennifer to blaze a trail that fit her unique situation-a female African American chef, living abroad – as a result, Your Resident Gourmet was born. During her time living in Germany, Jennifer honed her culinary talents by providing cooking classes for both military and German families. She was also able to fulfill a lifelong dream of attending Le Cordon Bleu College of Culinary Arts in Paris, where she once again graduated top of her class. 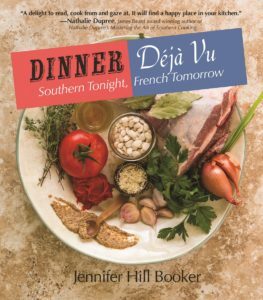 Twenty years later Jennifer finds herself once again blazing culinary trails as she wears many culinary hats as chef, cookbook author of Field Peas to Foie Gras and Dinner Deja Vu, reality TV personality, culinary educator, and business owner. 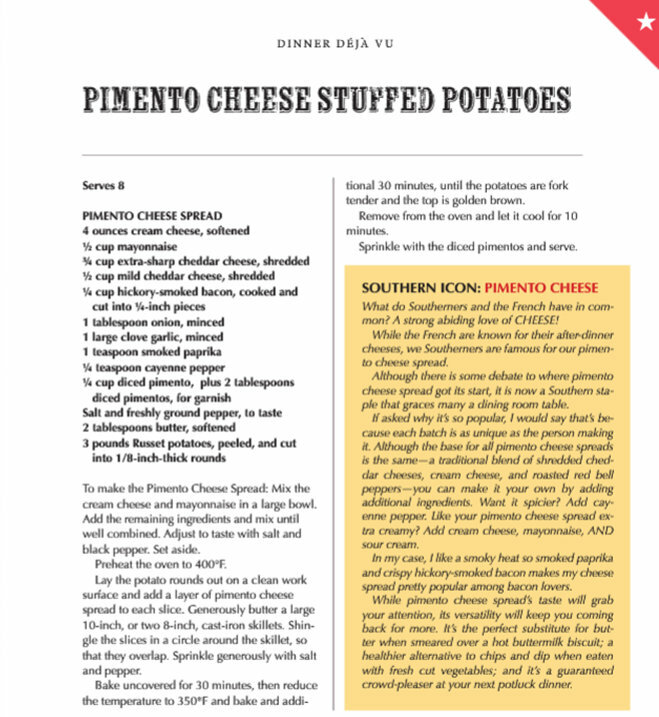 She is a Georgia Grown Executive Chef for the GA Department of Agriculture, the Culinary Explorer for the Georgia Department of Tourism and Travel, is the founder of Southern Divas of the New South™ Dinner Series, and currently sits on the James Beard Foundation Food Waste Advisory Council. Weaving her love of traditional Southern cuisine with her belief in incorporating healthy, seasonal foods and her classic French training, Chef Jennifer created a unique style of cooking that she termed Modern Southern Healthy Cuisine with a French Accent. Chef Jennifer shares this brand of cooking through her cooking segment ‘Chef Jenn to the Rescue’, on CBS46’s Atlanta Plugged In, with original recipes in such publications as Garden & Gun and Essence Magazine, as well as her Food Network debut as a finalist on Cutthroat Kitchen. Professionally for 20+ years. As a novice, I’ve been cooking since around 7-when I got my first Holly Hobby Oven. 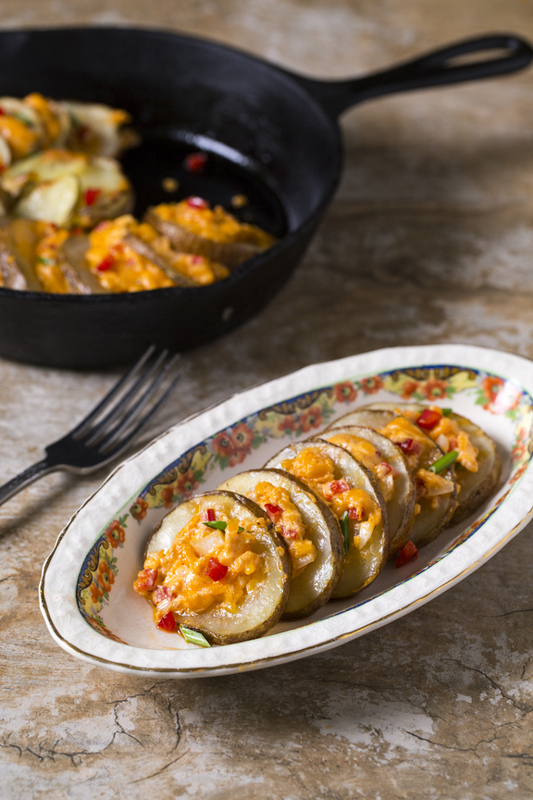 I love to mesh Southern and French ingredients and cooking techniques together to get what I call Modern Healthy Southern Cuisine with a French Accent. It’s not Creole or what’s typically found in New Orleans-I think it’s more Mississippi, Tennessee, Alabama style Southern with classical French mixed in. So more fresh seasonal produce, farm raised meat and poultry, and lots and lots of layered flavors. I don’t use much roux, hot spices, or heavy sauces in my food. It’s my foundation and what I use approach everything I approach-like black eyed pea hummus or a cassoulet with smoked ham hocks and salt pork. Eggs, cream, butter, some type of cheese, capers, olives, and bacon. I can make almost everything from those ingredients. I’m a Southerner at heart. Nothing makes me happier than cooking a pot of beans with a ham hock or ham bone thrown in. I also love greens-either cooked or served as a salad. Customers that are adventurous eaters and LOVE food! They are a joy to cook for. Those who give you the wash list of their dietary ‘restrictions’. You’re a grown up, you know what you can and cannot eat. Oh my gosh-this is a good one! I grew up on Tupperware but when I got my own place, I couldn’t afford it! Now I use a mix of Rubbermaid and Lexan – which is commercial kitchen storage brand that ends up in my home kitchen. I do like the glass Pyrex casserole dishes with the snap on lids-how clever is that!? Cocktails in polite company-but I really prefer my booze on the rocks. It tastes pure and without any pesky calories from mixers. I like recipes that work-and Ina Garten’s always do. For inspiration, I have to have lots of bright juicy pictures in the cookbooks I read- and the Culinaria cookbook series are beautiful. But my all time favorite cookbook? Julia Child. She explains her recipes, no matter how arduous, and soldiers through. Hands down a rubber spatula. You can stir, fold, mix, sauté, and scrape! Scraping the bowl, pot, or pan clean is near and dear to my heart because it prevents waste, you get that last bite that can make or break a portion, and it Saves Money. 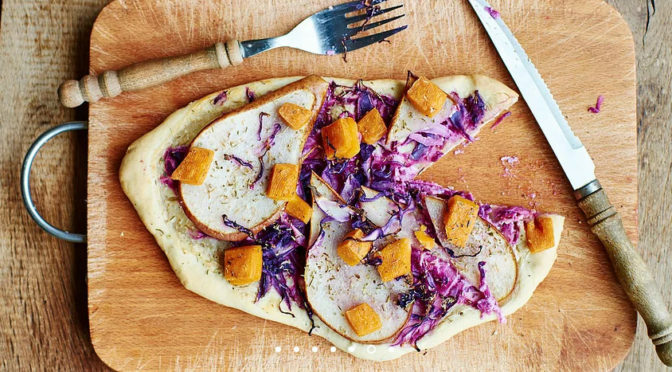 Why wash food down the drain when you can scrape it out and eat it?! Garlic. I Love Garlic. It adds aroma and enhances the flavor to a dish-and can be strong and pungent or soft and sweet. I don’t have a least favorite, but I am totally over Kale. Peel shrimp and clean the oven. I still have scars on my fingers for the thousands of pounds of shrimp I’ve peeled over my culinary career. I just hate taking the time to clean the oven! It takes smoke and a small fire in the oven to compel me to finally clean it. My all time go to favorites are Southern, Classical French, and Mediterranean (which for me is just a way to cook everything that has tomatoes, olive oil, and garlic in it). I also get excited by what’s in season or a style of cooking. I went through a period where I grilled everything-fruit, pizza, bones for stock! This is a hard one. I’m going to go with pork. 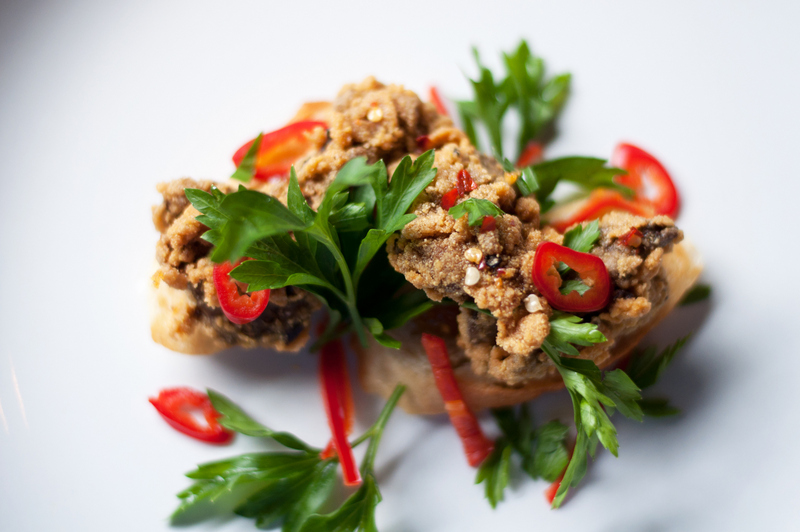 You can coax so many flavors and textures from pork that it never gets boring. If I had to eat one vegetable for the rest of my life . . . I guess it would be brussels sprouts. They taste like broccoli and cabbage and are so versatile I’d never get bored. I have a chef crush on Anthony Bourdain-mainly because of his bad boy imagine and he knows his stuff! A dear friend of mine, Chef Joe Randall, has my unwavering admiration. He’s been cooking as an Executive Chef for 40 years. He’s run kitchens (both North and South), written cookbooks, owned a cooking school, mentored young chefs, and currently runs the African American Chefs Hall of Fame in Savannah, Georgia, and unapologetically promotes Southern cuisine. None of which are easy-especially for a proud Black man in America. I’m all about the savory! I love big flavors that range from my Mother’s turkey & dressing to roasted tomatoes and garlic with fresh basil and shaved parm or a muffuletta from Central Grocery in New Orleans that I smuggle home and bake in a cast iron skillet with another skillet pressing it down. Now I’m hungry! Cauliflower-how can it be a vegetable when it’s white?? It’s almost like broccoli’s twin sister, while broccoli is popular and has personality, cauliflower is bland and boring and hoping people will like her. I have 2 tattoos. One is food and it’s also my Zodiac sign . . . I’ll let you figure that one out.